Last Postcard Friendship Friday, my daughter and I were at the Minnesota State Fair having fun. I, of course, went to see the old vintage postcard boards entered in competition in the Creative Arts Building. The postcards on them are always very interesting to view as sets/groups. I took pictures, but they didn’t turn out. Bummer. I came across something else I thought you might find fun though. Read on. I also saw the butter sculpting of the Milky Way Dairy Princesses (head busts only). 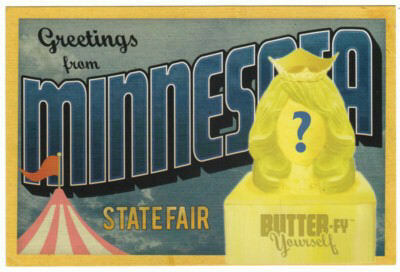 Butter sculpting has been a MN State Fair tradition for around 30 years. On the way out of the building, I picked up an psuedo advertising postcard for the Midwest Dairy Association I just had to share. On the back, it gives directions on how to “Butter-Fy” yourself. The directions aren’t quite right though. Instead of selecting the “Butter-fy Yourself” link once on the Midwest Dairy page, select the “Visit us at MidwestDairy.com” link. I tried to Butter-Fy myself, but my pic wasn’t in the right format. I’ll try again though. If I get it to work, I’ll post the results. Be sure to stop by The Best Hearts Are Crunchy for Postcard Friendship Friday where people share all kinds of interesting postcards. ** If you liked this postcard blog post, please click on either the below links or the bookmark link to the lower right. Thank you for visiting. I am once again participating in Postcard Friendship Friday, sponsored by Beth over at The Best Hearts Are Crunchy blog. I don’t have a father-in-law related postcard, but thought a reprint of a 06/21/09 post on Facebook by me might be nice. It is with great love, that I look back on the sacrifices and tremendous amount of love my Dad has shown me over the years. Thank you Dad for teaching me to tie my shoes, for letting me stand on your feet to feel taller, for letting me tag along after you everywhere, for dropping everything instantly (and once leaving his business unattended) each time I cracked up my car (and for not yelling at me), for holding my hand when my daughter was in emergency surgery, and for working so hard to put a roof over my head and food on my plate. 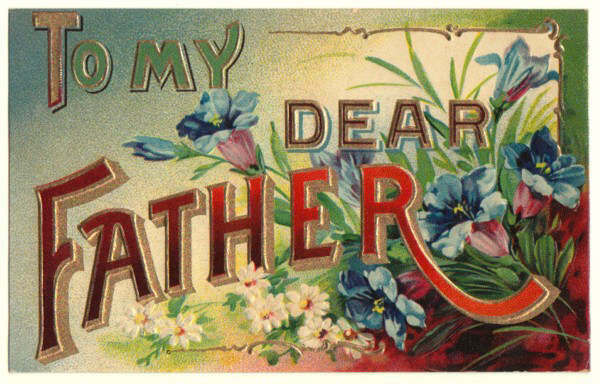 Please feel free to comment about the memories you have about how your dad has shown his love for you. Hello New York Zoological Park vintage postcard tour participants. It seems our tour has hit a “snag” by developing a migraine. Bummer. Please hold onto your tickets. They will be good for the resume of our tour on Thursday, 03/04/10. Thank you for your patience as we repair the tour guide. Extra strength Excedrine Migraine should do the trick (and a little more sleep). I found this real photo postcard of barefoot Dutch children kissing cute and thought my readers might too. After all, this season is sooo full of cuteness. Happy Holidays! ** If you liked this image, please click on the bookmark button to the lower right. Wow, my daughter’s 21. I officially feel old. How come? My daughter’s the one who turned 21. Anyway, she has decided she wants me to take her bowling. The bowling alley has a bar, so she’ll be able to legally order a drink. I’m the designated driver. Her drinking should make for an interesting time bowling. I’ll have to bring my camera. This still didn’t seem like a fitting tribute to her entrance into adulthood, so I searched on-line for ways to celebrate birthdays. OK, so I have no imagination. I run two on-line postcard stores and work a full-time job. Give me a break. What I found had me laughing my head off. There’s a blog about toilet birthdays. Really. This blog actually celebrates the birthdays of various toilets (complete with pictures)! Geez, the things one finds on the internet these days, lol. The first three paragraphs of the tip page are hilarious. If curious, click this. I’ll have to have my daughter read it when she comes home from partying with her first hangover (like the man in the above antique New Year postcard). I wonder if she’ll be able to follow the directions at the beginning of the tip page. Again, I’ll have to have my camera ready. By the way, my toilet’s birthday is 07/22/04. …NOTICE: This is to forbid all persons from harboring or trusting my two daughters, Betsey Russell 18 years old, and Lydia Russell 10 years old, as I shall not pay any debts of their contracting after this date. By Israel Russell, East Wareham, September 20, 1864. Oh, Oh. Someone’s been spending too much of daddy’s money. This is from the pre-1900 Canton Journal and courtesy of LOOKING BACK…IN CANTON HISTORY by Chris Brindley. It’s an interesting read with little tidbits of history on early Canton, OH history; kind of like the gossip columns of small town newspapers. I was driving my Mom to her 5th chemotherapy appointment yesterday (she’s battling breast cancer), when we happened across a dead skunk right at the entrance to the hospital. As expected, it STUNK. Holding my breath didn’t work. I ended up breathing the aroma in anyway as I gasped for breath a short time later. How appropriate that the skunk was killed at the entrance. My family is hoping Mom’s cancer is rendered as lifeless as that skunk now was. So far, so good. Life sure can be a stinker sometimes.